Please bear in mind that this article was written many years ago – December 1990. Since then, duplicates of some of the pieces shown here may have turned up, making these items no longer “One of a Kind”. The prices will reflect when this was written. This is the second half of the article that appeared in the last quarterly issue of the Pump. As was printed out at the time, the pieces shown here are also the only ones that are known, to my knowledge. The uniqueness that makes them “one of a kind” is sometimes pattern, sometimes color, and sometimes shape. Now and then a piece will qualify in a couple of areas. For example, the wisteria whimsey Tornado vase shown in Part 1 is unique both as to shape and color. 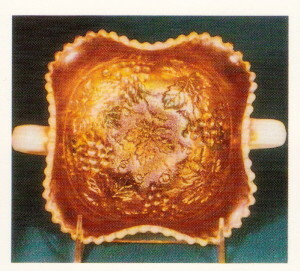 PEACH OPAL WISHBONE AND SPADES CHOP PLATE (DUGAN). 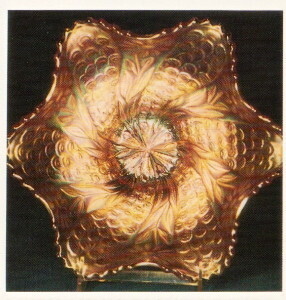 Dugan made a lot of peach opal Four Flowers plates in both the chop plate and the six inch size. That was not the case with this Wishbone and Spades pattern. 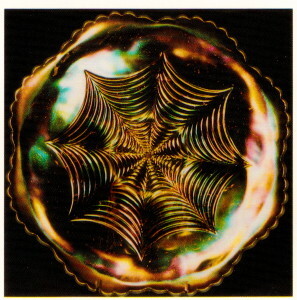 This is the only confirmed peach opal chop plate. It came from Dennis Keck back in 1976. Thanks, Dennis. 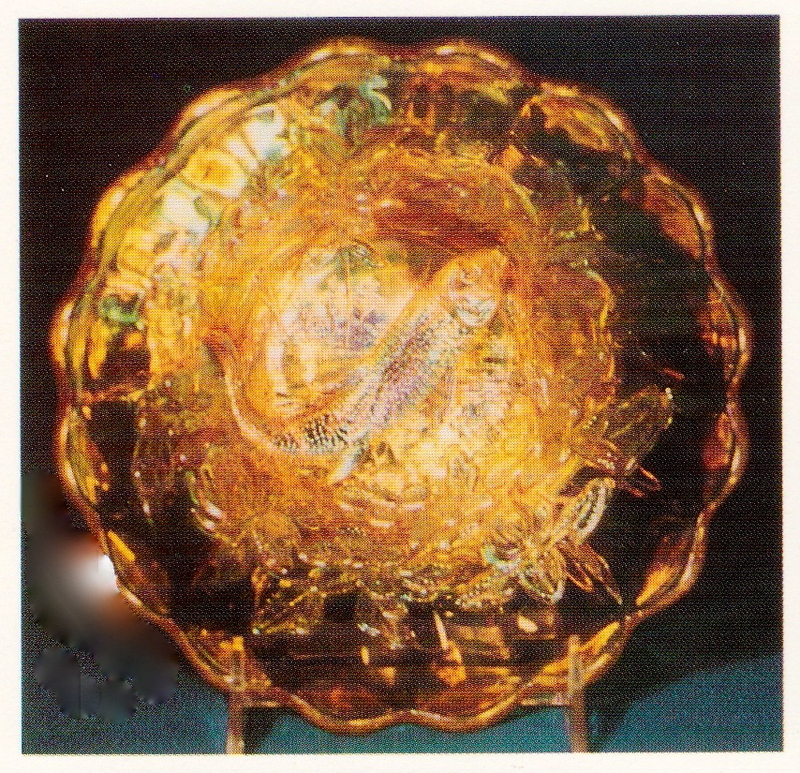 MARIGOLD SEAWEED MASTER ICE CREAM SHAPE BOWL (MILLERSBURG). This piece is normally ruffled. The one shown here in marigold and one in green are the only two I’ve heard of in this shape. This one came out of the Bill Carroll estate auction in 1983. It sold for $300. VASELINE MILLERSBURG HOLLY SPRIG ROSE BOWL. 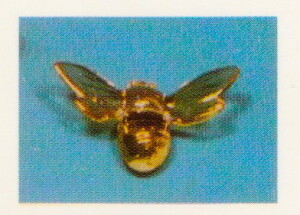 This piece was found by George Loescher and sold to the Hills. They sold it in their auction in 1983. It brought $400. It has a double uniqueness in that it is vaseline and in the rose bowl shape. 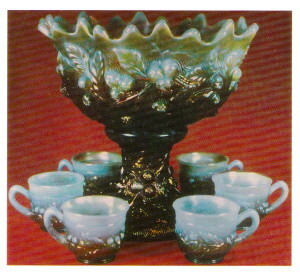 AQUA OPAL ACORN AND BURRS PUNCH SET (NORTHWOOD). This set was found in New York and sold to Mrs. Hartung. We bought it at her estate auction in 1983 for $12,500. We have since added a sixth cup. Several other cups and a base or two are known, but this is the only confirmed complete set in this color A second set has been rumored for years in the midwest but never really nailed down. AMETHYST SEAWEED SAUCE (MILLERSBURG). In his research notes on Millersburg, Jack Wilson reports only this one sauce is known in any color. It sold at his 1982 auction for $450. VASELINE BIG FISH DEEP ROUND BOWL (MILLERSBURG). This is one of the five vaseline bowls known in this pattern. Each is shaped differently. 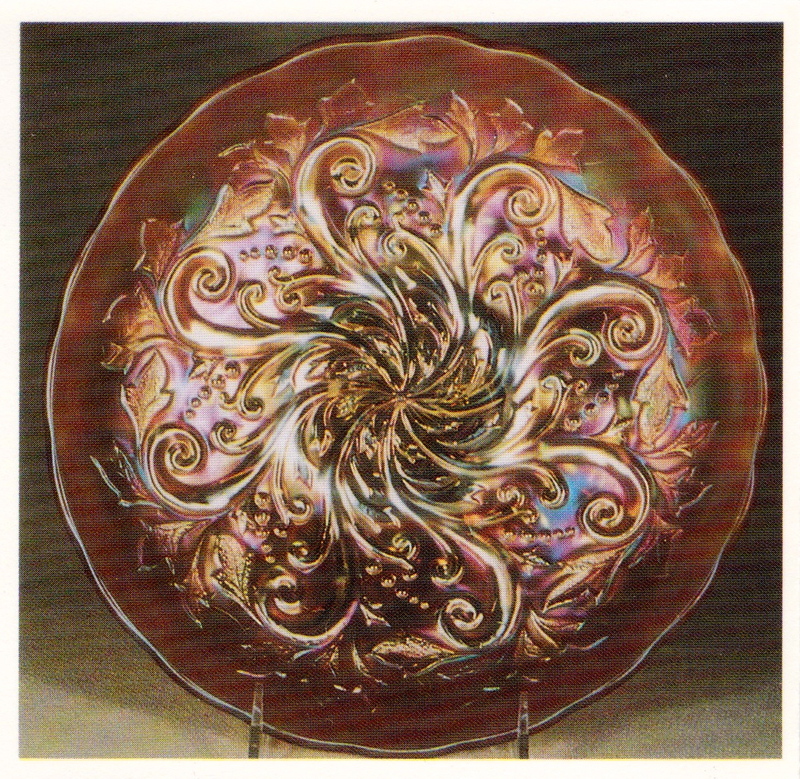 The color and iridescence on this particular piece is the most spectacular I have ever seen on any vaseline carnival glass. It sold privately in 1986 for $4500. PEACH OPAL GRAPE AND CABLE BONBON (NORTHWOOD). Northwood is supposed to have made no peach opal but a few pieces have turned up. 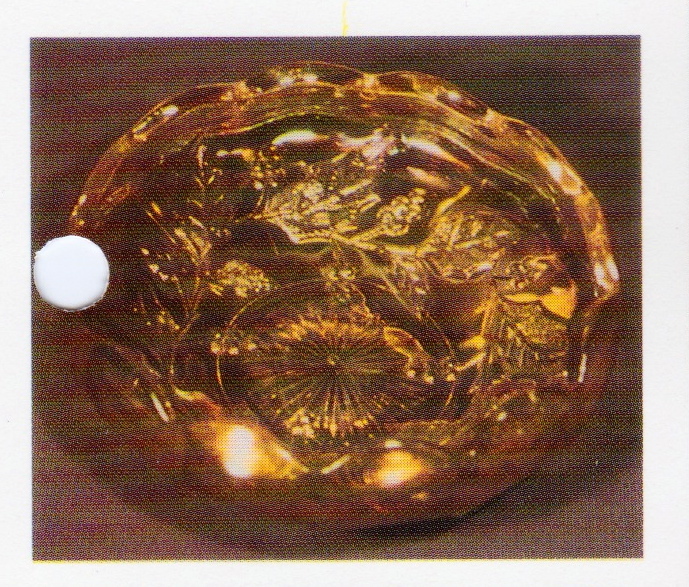 In addition to this bonbon and the Nautilus pieces, the Williams of Lodi, CA have a Beaded Cable rosebowl. Chas. Perry of Southhaven, MA found this bonbon and sold it to me. In another twelve months it will be paid off. It is up for grabs as to when these pieces were made by Dugan after buying the old Northwood factory and molds. MARIGOLD PEACOCK TAIL AND DAISY BOWL (WESTMORELAND). 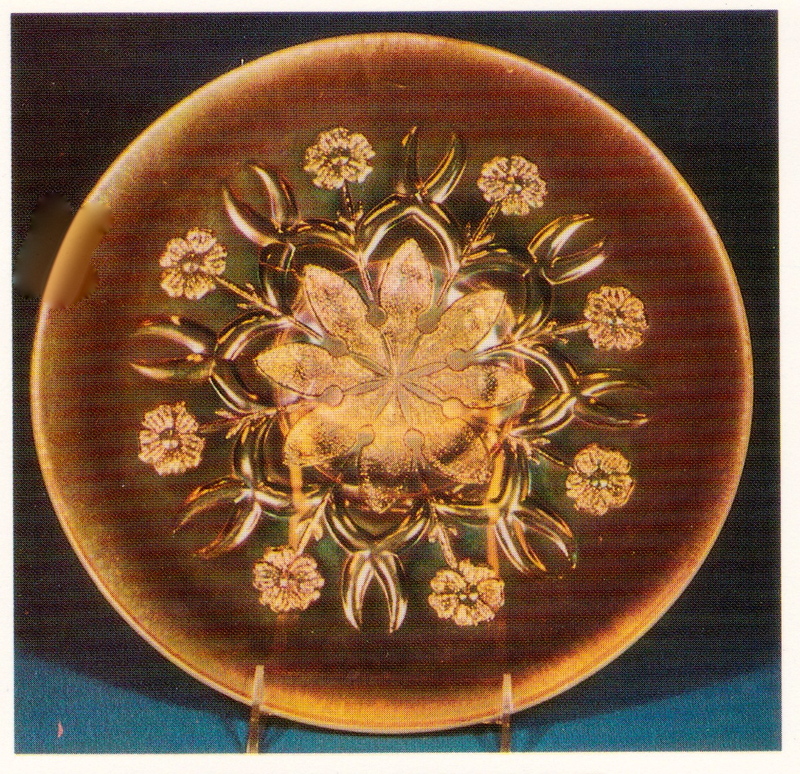 In addition to this marigold bowl, one in amethyst is in the Fenton museum and George Loescher has a third one on iridized blue milk glass. These are all very rare and desirable. The one in marigold sold privately in 1986 for $800. WHITE POINSETTIA RUFFLED BOWL (NORTHWOOD). I may be wrong on this being one of a kind. It seems to me I may have heard of a second one or at least rumors that another one in white was out there. I bought this bowl from the late Jack Stewart many years ago. It is a very rare and desirable piece. MARIGOLD LATTICE AND GRAPE SPITTOON (FENTON). 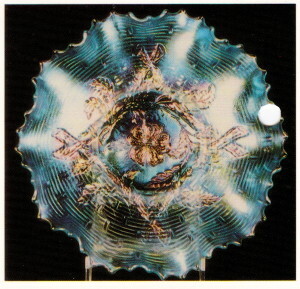 This piece was brought to the late Bill Heacock at one of his glass programs. It ended up with John Resnik and John later sold it to me. This spittoon is shaped from the tumbler. The note that came with this piece adds to its interest and value. It reads: “Emma Coulter, sister of Samantha Smith rubbed snuff all her life. 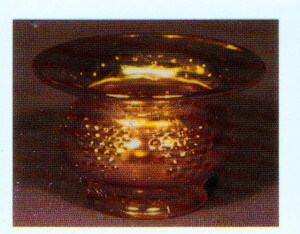 In 1918 she worked at the Fenton Glass Factory at Williamstown, WV, so one of the men knowing she had to spit made this tiny spittoon for her to use. She gave it to me (Samantha) before she died in 1970. 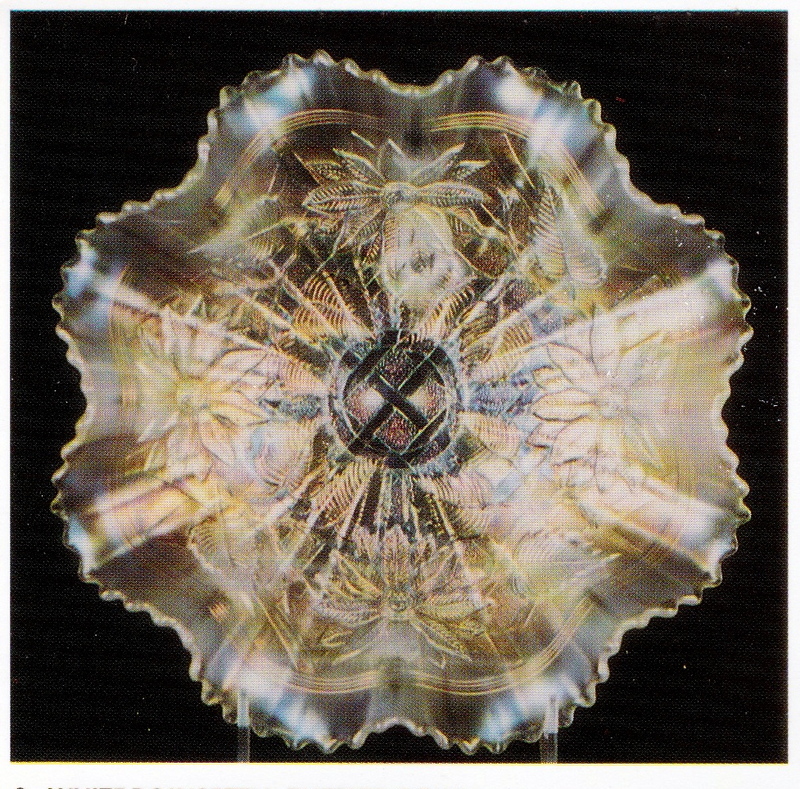 Carnival glass. 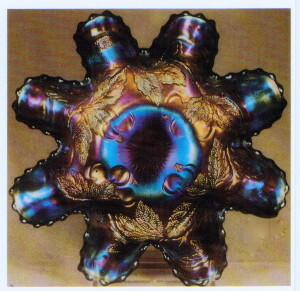 Only one of its kind made.” I’m not positive she was correct in calling this “the only one made” as it seems I may have heard of another one that is shaped somewhat differently. MARIGOLD BUMBLEBEE (MAKER UNKNOWN). I know nothing about this little cutie. We bought it from a lady who said she had owned it for many years. It appears to be an old piece. If contemporary I would think more of them would have turned up. ICE BLUE APPLE BLOSSOM TWIGS BOWL (DUGAN). This bowl has been a mystery. While Dugan made lots of white carnival, ice blue is a pastel color not associated with this company. To my knowledgle, I have not heard of another piece of ice blue Dugan or Diamond. I bought this bowl from Jim and Nan Warren many years ago. BLUE BUTTERFLY AND BERRY SPITTOON (FENTON). This whimsey spittoon is shaped from the bottom of the sugar bowl. 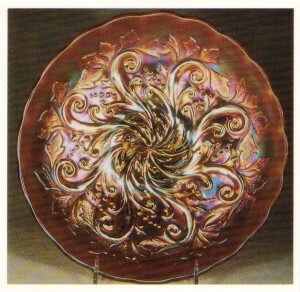 The Rineharts have a smaller version in amethyst that was made from the individual berry bowl. we bought this piece from a lady in Sonoma, CA some 20 years ago for $87.50. It had been packed away in a barrel for years and had belonged originally to relatives who had worked at various glass factories along the Ohio river valley. All of the carnival in this barrel was outstanding in color and iridescence. This has always led me to believe that even indirect sunlight over a period of years may have a negative effect on color. 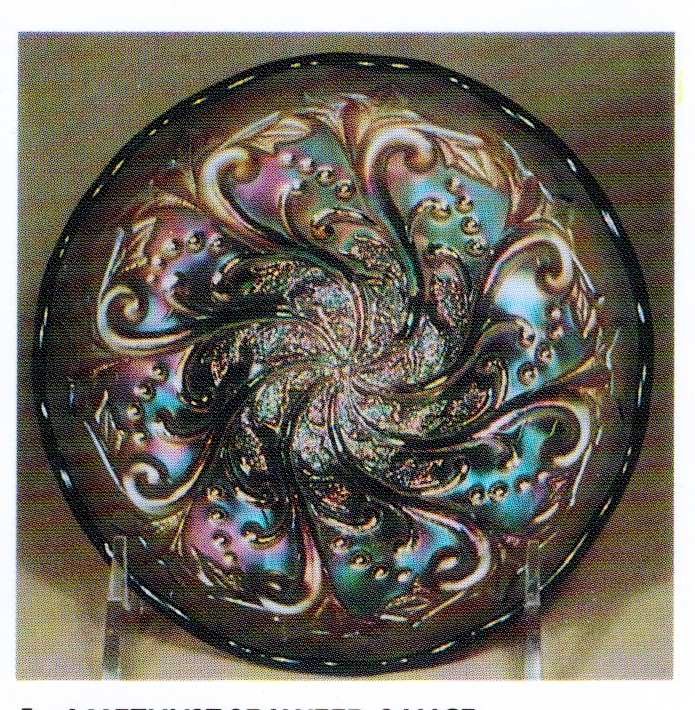 PEACH OPAL HEAVY WEBB CHOP PLATE (DUGAN). We bought this rare plate from a couple in Larned, Kansas who had in turn bought it from Mrs. Hartung many years before. Mrs. Hartung had acquired it from Mrs. Wilbrett of DeKalb, Illinois. It is the one she pictured in her Book 8. 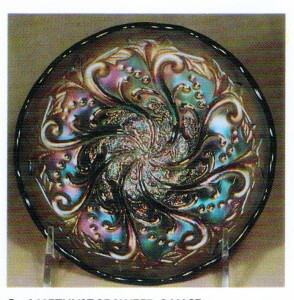 It measures nearly 12 1/2” (same as Persian Garden chop plate) and is a heavy, spectacular example of carnival. 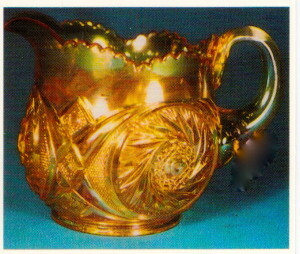 MARIGOLD AZTEC WATER PITCHER (McKEE). 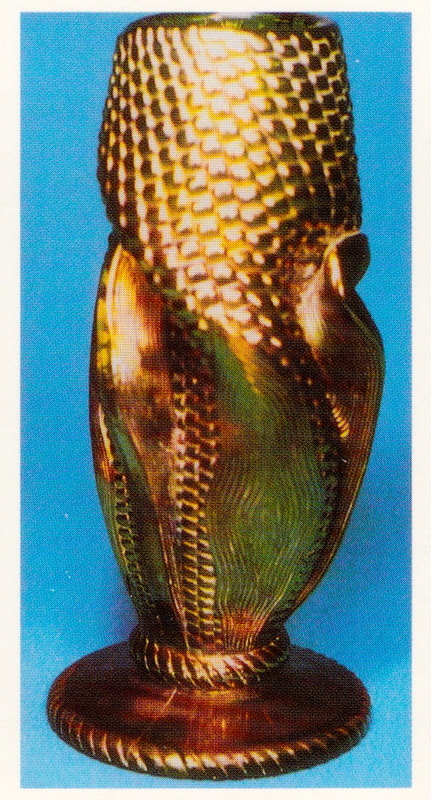 This pitcher was found in Colorado by John Muehlbauer. We bought it from John in 1980. When found, it had six rare Sydney tumblers making up the set. These tumblers were made by Fostoria, so just how they ever got together with the McKee pitcher will probably never be known. MARIGOLD MILLERSBURG DIAMOND PUNCH BOWL. 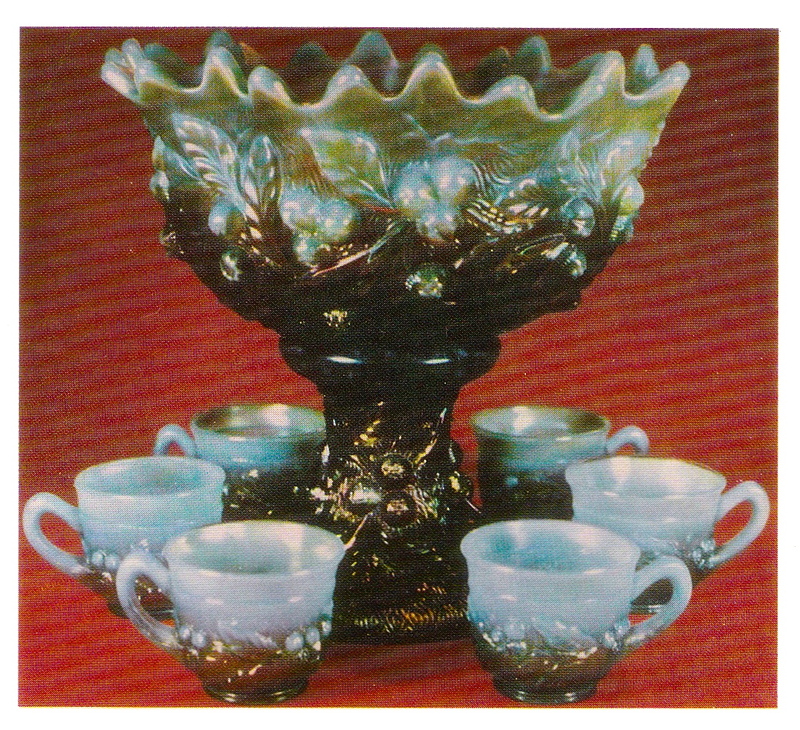 A single bowl and base is known in three different colors – green, amethyst, and the marigold as shown. 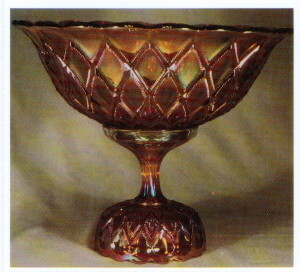 we bought this bowl and base at the American Convention auction in 1986. It sold for $1600 and came with six marigold Diamond tumblers. The original owners said these tumblers had always been a part of this set. Since no cups in any color have ever turned up in this pattern, they may indeed have been intended for use with both the water set and the punch set. 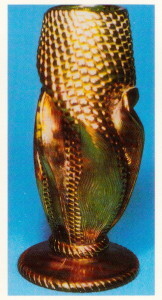 GREEN CORN HUSK WHIMSEY VASE (NORTHWOOD). 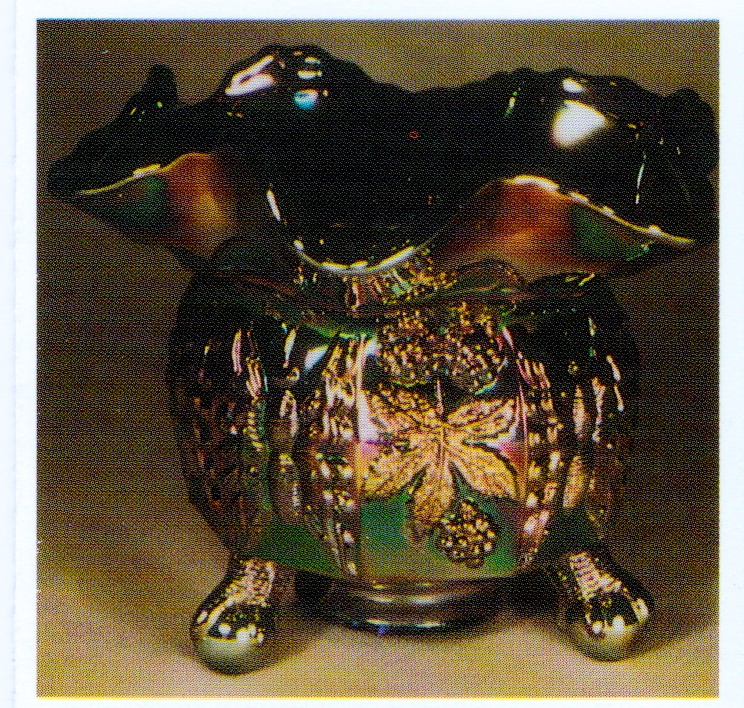 A second green vase in this rare pattern is owned by the Loeschers but the one shown here is squeezed into quite a different whimsey shape. 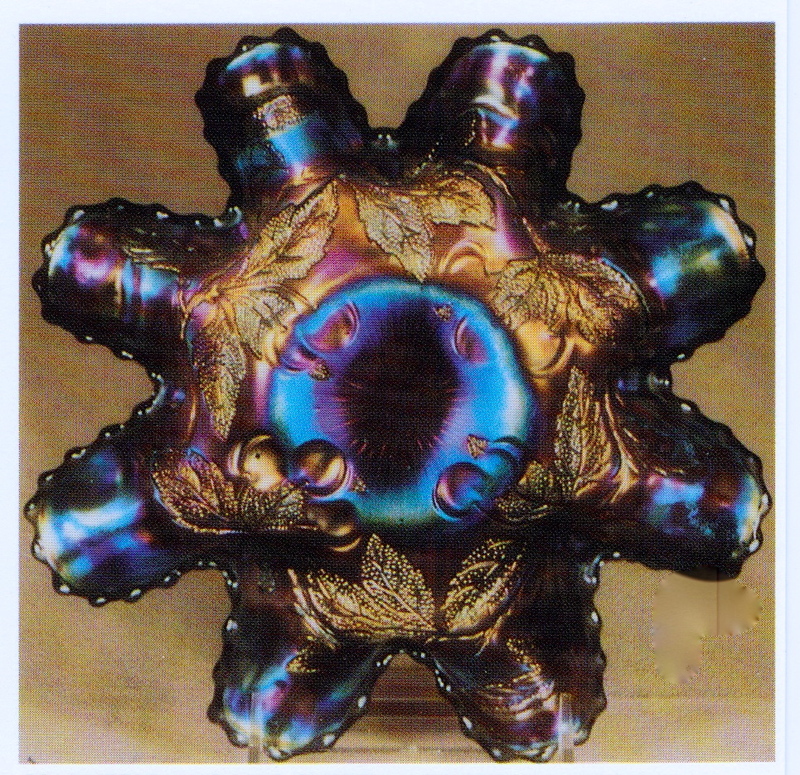 Three or four of these are known in purple. One of them sold at auction several years ago for $5000. We found this one at a small show in Oakland, CA for $60. I’m still mad at the dealer for refusing to come down to $50. Oh well, you can’t win them all. PURPLE DUGAN’S CHERRY WHIMSEY SHAPE BOWL. I feel justified in calling this a “whimsey” shape as I have never seen another one like it. 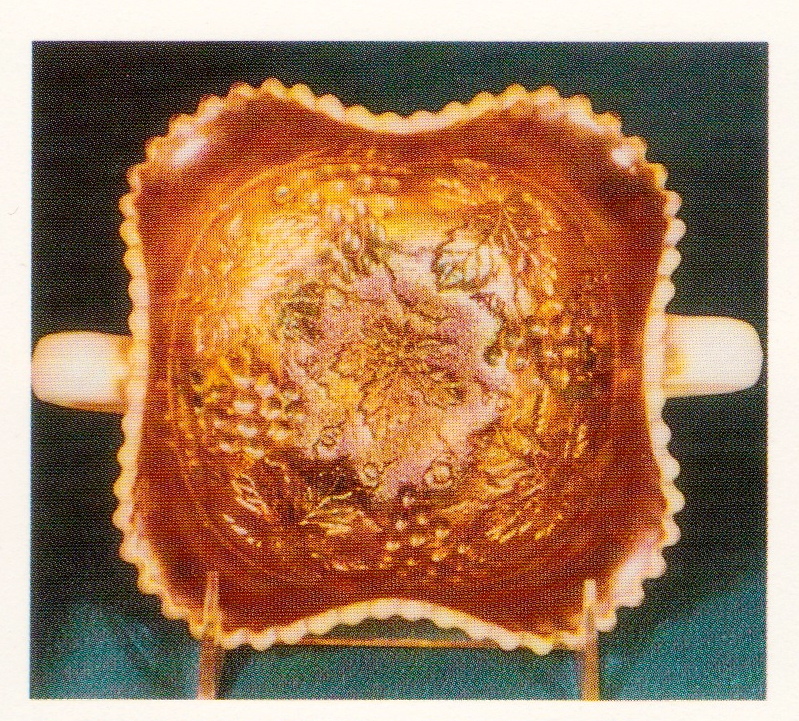 The eight heavily crimped ruffles adds much to the beauty and value of an otherwise routine bowl. We are indebted to Tom Burns for finding this piece for us. Well, this completes the two-part series on “One of a Kind” pieces. Please do let me hear from you if you have one of these, or know where one may be. In this way we can add to our storehouse of knowledge concerning this obsession of ours. It’s no secret that we’re crazy but there’s nothing that says we can’t be informed.